Note: A minimum quantity of 74 must be ordered, and in units of 1 thereafter. 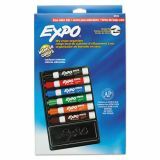 EXPO Low-Odor Dry Erase Marker & Organizer Kit, Broad Chisel, Assorted Colors, 6/ST - Keep supplies all together near the board with this dry-erase organizer. 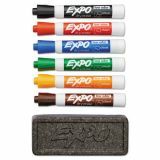 Durable dry-erase organizer attaches to any smooth surface with the included pressure-sensitive, double-stick tape. 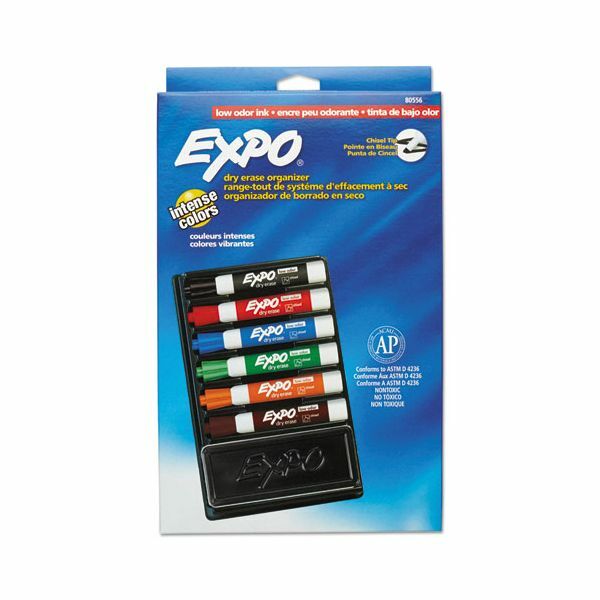 Seven-piece kit includes an Expo eraser and chisel tip, low-odor markers: one each in black, red, blue, green, orange and brown. 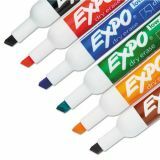 Markers feature a versatile chisel tip for broad or fine writing. Quick-drying, smear-proof ink provides consistent color quality. Nontoxic ink easily erases from whiteboards, glass and most nonporous surfaces. 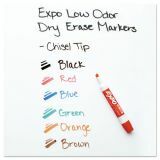 Low odor markers are perfect for classrooms, small offices and the home. Quick-drying, smear proof, ink provides consistent color quality.